Anson Gard was North Bay’s first oral historian. An American by birth, he had spent over seven years in Canada and had published a dozen Canadian books by 1909, the year his North Bay: The Gateway to Silverland was published. Here, as in the Ottawa valley and Cobalt earlier, he traveled through the area, spoken to people, gathered their stories, and wrote them down. He also did research in the files of North Bay’s two early papers, the North Bay Times and The Despatch, newspapers which unfortunately have all but disappeared today. He sought out those who had collected photos of the early days and included a photo essay on North Bay along with his text. Gateway to Silverland, consists of three distinct sections. The first, “Gateway to Silverland,” is made up of the stories he collected. These range from very obvious tall tales to much more factual information such as a list of firsts and histories of founding societies, schools, and churches. There is also a chapter on the railways and one on the Georgian Bay Ship Canal. The second section is his photo essay, “North Bay in Picture, the Old and the New” which includes many interesting early photographs, only some of which can still be found. The third section, “Patrons of ‘The Gateway,'” consists of sixty biographical sketches of the leading members of the town, many of them members of the Board of Trade, who supported his efforts. Anson Gard did not write the kind of book we would write today. There is no doubt that he adopted the boosterism of his patrons and wrote of North Bay only in the most glowing of terms. It is also clear that he had little opportunity to meet ordinary working people; his informants were among the most affluent in the town, male, and Anglophone. He was aware of the presence of the First Nations in the area and devotes a short section to their history, but he does not appear to have spoken to any of them. He makes infrequent references to French Canadians who contributed to the early history of North Bay, but seldom refers to any of them by name. Today such a clear bias would be unacceptable. 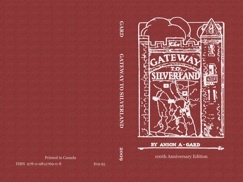 Why, then, an anniversary edition of Gateway to Silverland? Through his stories Gard brings to life the flavour of North Bay at the time. It was the entertainment capital of the area. Tall tales were told around the fire and practical jokes were played on newcomers. Railroaders were bigger than life as they heroically steamed into town to vote on the choice of a District capital. His biographical sketches read like a street directory – Ferguson, Leask, McKeown, McGaughey, Parsons – and are an excellent starting point for anyone wanting to research the genealogy of these local families as he usually gives a place of birth and the maiden name of the wife. For one hundred years now, the stories that Anson Gard recorded about early North Bay are almost all that we know about these early days. They have been repeated, often without giving him credit. He deserves to be read in the original where what is fact and what is tall tale can more easily be discerned. He also deserves to be credited for his accomplishment. Since his book has long been out of print and remaining copies are expensive, a new anniversary edition will make it possible for those interested in North Bay history to read for themselves this wonderful story teller. His book, he wrote, involved “the recalling of memories, and preserving of those memories to those who may in the future see the part played by some ancestor” (p. 116). He could not have predicted the extent to which his efforts would be vital in helping to keep those early days alive in our collective memory. W.K.P. Kennedy’s North Bay: Past–Present–Prospective is a compilation of useful information rather than an analytical history. Kennedy was very familiar with North Bay’s early history, having arrived in North Bay in 1887, and he was given access to sources which can be difficult to get to today. For example, his section on municipal government summarize the minutes of council for every year from 1894 to 1960. Even in a summarized format, these provide us with an overview of important issues and the original minutes or the Nugget can then be consulted to find out more. He acknowledges having made use of Anson Gard and the Nugget, and the 1925 Old Home Week section clearly makes extensive use of the 1925 souvenir book. He provides lists of charter members of organizations, of businesses, hotels, schools, and churches, short histories of the railways, sports, and personalities, as well as some of his own recollections. It is an essential starting point for further research. The major drawback of this source is that almost fifty years have elapsed since it was written, leaving a long gap where similar information is not available. Like Gard he tends to be more familiar with anglophone North Bay but the book includes wonderful surprises like the image of Felix Labreche’s blacksmith shop shown here. This entry was posted in Community History and tagged Anson Gard, North Bay, North Bay Gateway to Silverland, North Bay Past-Present-Prospective, printed sources, W.K.P. Kennedy on January 22, 2013 by Françoise Noël.